emmatree: Life Imitates Life: Broken is as Broken Does. A broken day, ending with me thinking I just can't take any more, people needing images in file types I know nothing about, the ever-wonderful Michael hoarse, trying to explain it to me, this morning a rush to the bank to make a deposit, 41 cents all there was in my account, but a fabulous 41 cents, like a finger in a dyke, preventing a flood of overdraft fees. Like I said it was a day broken from the get-go, and by 5 pm I really couldn't take it any more and closed my office doors, lights off, and lay down on the floor to just breathe, just breathe, just breeaatheee, then up for another round, taking out trash, trying my very best Forrest Gump daggers-stare on the computer, the stare by the bus in DC, saying bye to Jenny once again, her terrible boyfriend on the bus with her, but computers have better stares than people, and it was useless, so I called it a day, time to come home anyway. And opened my office door to find I'd crushed the silver Christmas ball that hangs from my crappy old doorknob. The doorknob we can't figure out how to remove, and so I'd painted around it 3 or 4 years ago, disgusted, disheartened that I couldn't have a new pretty doorknob, and I'd left the masking tape on it and just walked away, forgot about it. There's always stuff hanging from it anyway and that's how/why I opened the door to find pieces of silver scattered all over the floor. And that's when I knew to just stop. Put down my jacket, put down my camera, my tote bag, my purse, my cell phone, the grocery sack of cat food, my keys - just put it all down and stop. And I knelt there in my doorway and picked up each little shard, each little broken piece, took the time it took to check the carpet, and breathed into the picking up of those remnants of a broken day. I'm keeping the broken piece still tied to the ribbon. What better reminder? And I'm taking the tape off the doorknob, scraping any paint that's there - it can't be good feng shui. keep in mind on this broken day that anything that shatters, especially glass, means WONDERFUL things...like some aspect of your past is done now. finished. over for good. that's reason to celebrate! and lest you forget, Darlin', we is about to become famous. ya..hooooo! and if all this fails to impress a happy smile on your no-good day, succumb to the numb of the bear cam. www.bear.org. Oh, the bear is bookmarked, already oohed & ahhed over & posted on my facebook page. And dear God, that is fabulous that the broken ornament is the end to something & the beginning to something wonderful, And YES! We IS about to become famous!!! Ahh love. Hoping tomorrow will be filled with magic once again. I read my way through this post wanting to give you a big hug...and then by the end you have me laughing out loud! Old masking tape and feng shui? I love it! 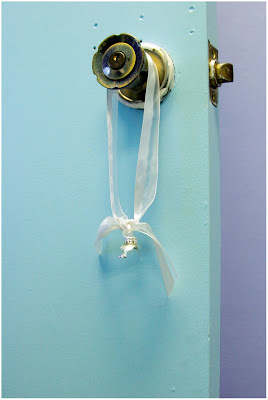 the doorknob...i have had so many projects in my house that get to that point, 99% done but for that one tiny thing that somehow hangs on for years. waiting for us to reach the moment when there is nothing else to do but tear the tape off. quickly, so it doesn't hurt. You have turned your bad day into poetry. And I love the color of your door. I am loving both colors...door and wall. What a dreamy combination.